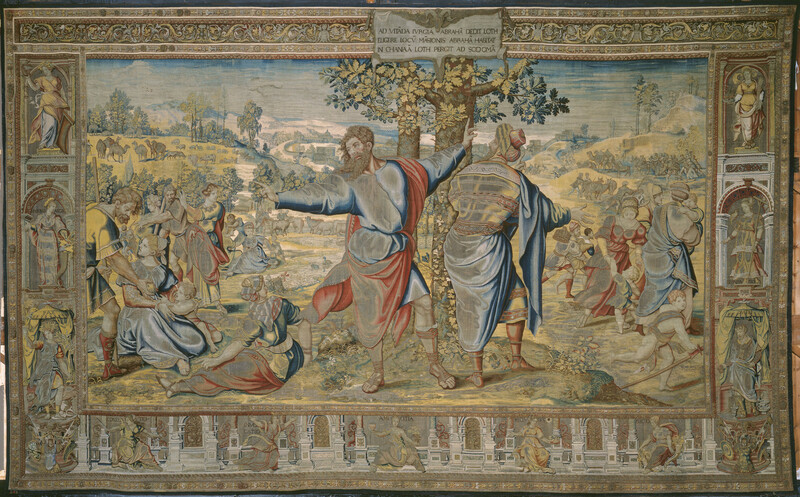 Ten panels from a series of Brussels tapestries depicting the scenes from the life of the Prophet Abraham, from Genesis, chapters 12-24, woven in the workshop of Willem Pannemaker, perhaps after designs by Pieter Cocke van Aelst. 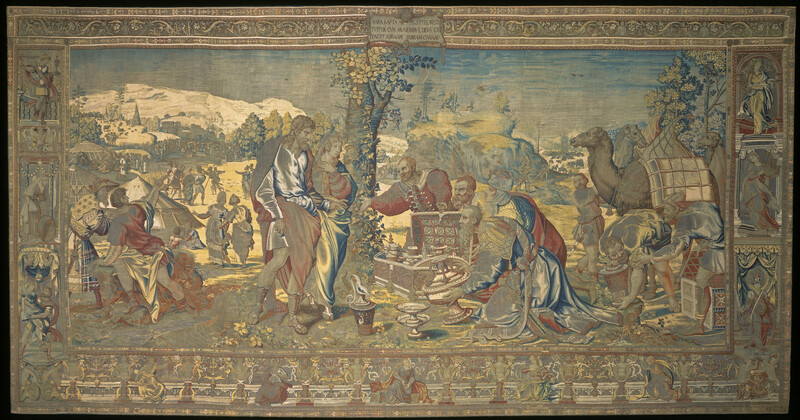 The scenes depicted are: the Departure of Abraham; the Return of Sarah; the Separation of Abraham and Lot; the Meeting of Abraham and Melchizedek; God appears to Abraham; the Circumcision of Isaac and the Expulsion of Hagar; the Sacrifice of Isaac; the Purchase of the Field of Ephron; the Oath and Departure of Eliezer; and Eliezer and Rebekah at the Well. 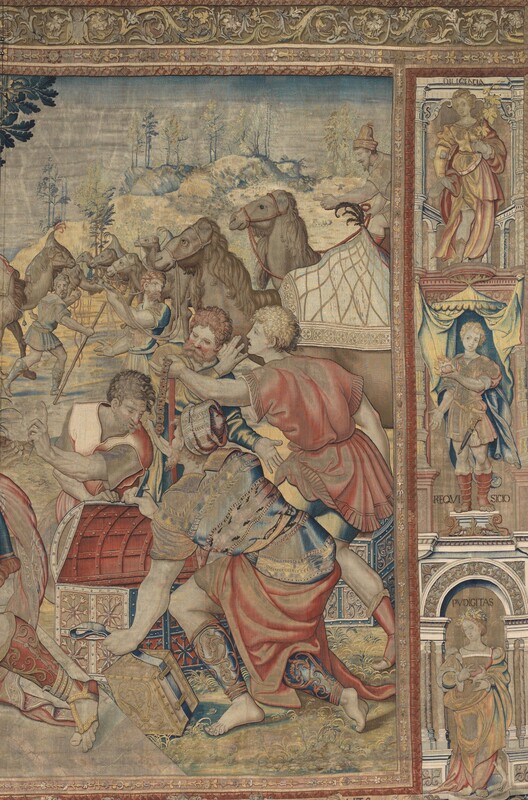 Although it is not yet known if Henry VIII commissioned this set of ten tapestries, that it is the only known set of this series woven in gilt-thread, suggests that it is highly likely Henry was the patron, and that the Hampton Court set is the first weaving. 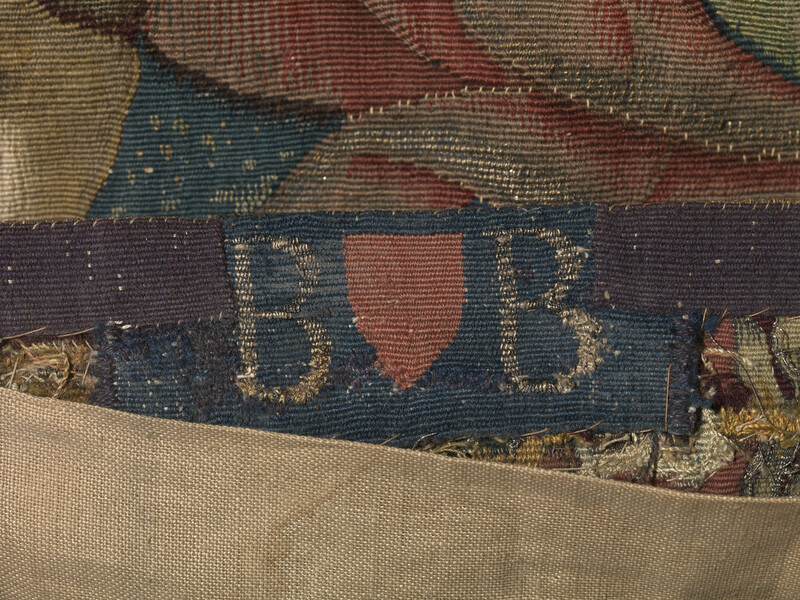 Two other sets are recorded, one in Madrid and one in Vienna, neither of which combine gilt-thread with silk and wool. 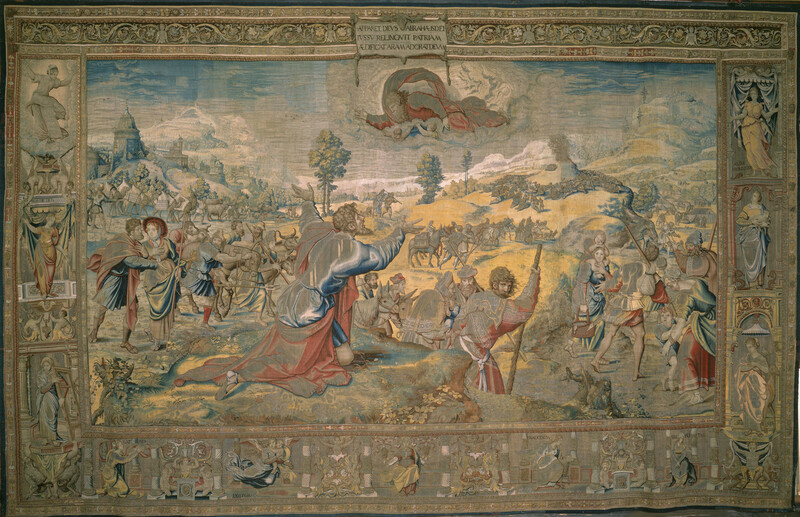 Henry's tapestry collection was extensive, exceeded only in number by Louis XIV of France at the end of the seventeenth century. 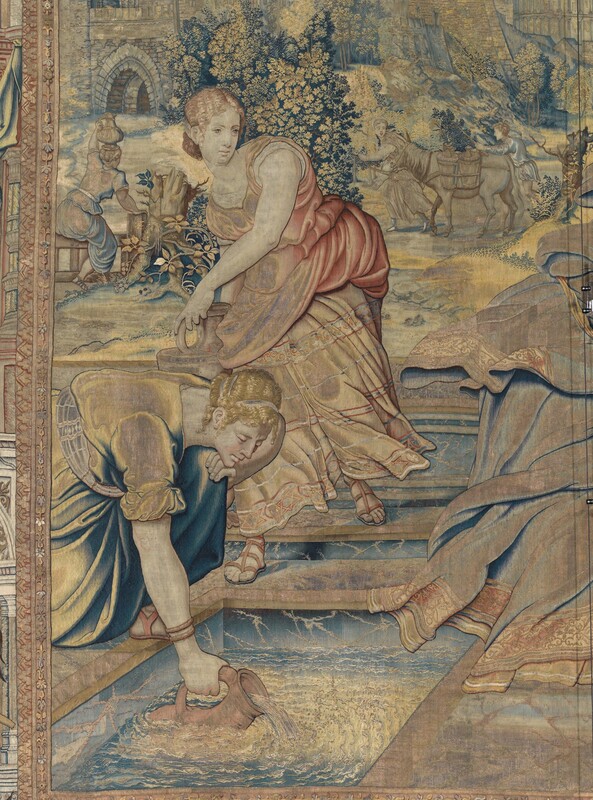 Henry owned a number of other tapestry series woven with gilt metal-wrapped thread, none of which survive. One hundred years after Henry's death, after the regicide of Charles I, the Royal Collection was valued and large quantities sold off. The Abraham series, however, was not sold, but reserved for Cromwell's use. 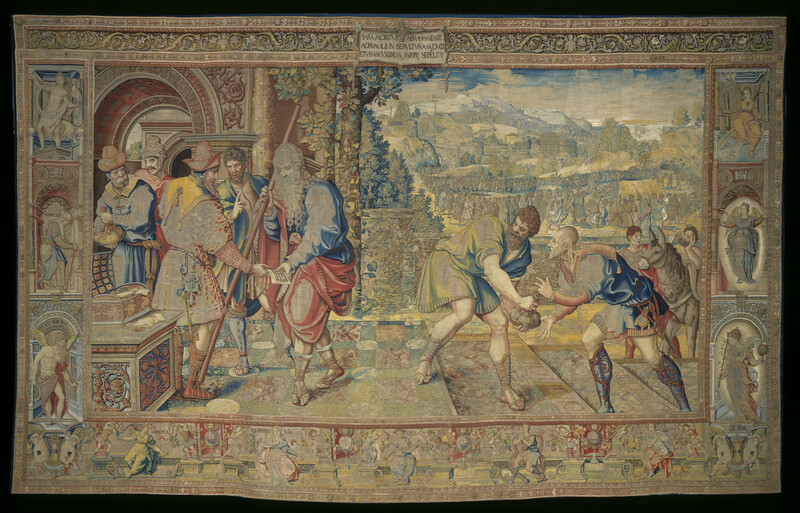 The series was valued at the astonishing sum of £8260, far in excess of any other work (or collection of works) of art, and almost double the value of the next most valued tapestry series, the Caesar set, valued at £5022. 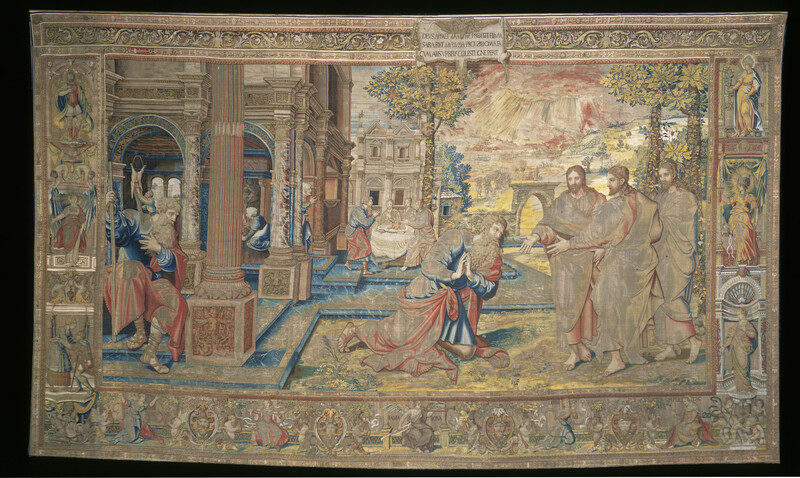 Henry may have conceived of this series and its Old Testament Patriarchal subject matter as particularly powerful in the context of his own political situation: following the Break with Rome in 1530, the establishment of the Church of England and the Dissolution of the Monasteries, Henry may have used the Story of Abraham, and the Covenant with God as a means of legitimising his own direct God-given rule. 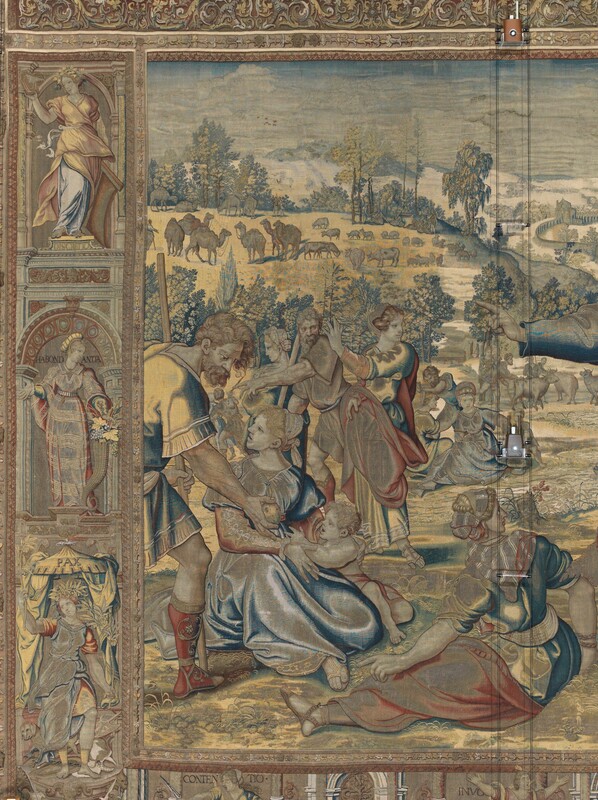 Furthermore, Henry's desperate attempts to provide a male heir and to secure the Tudor dynasty are hinted at in The Circumcision of Isaac, in which God's covenant with Abraham is continued through his son Isaac. 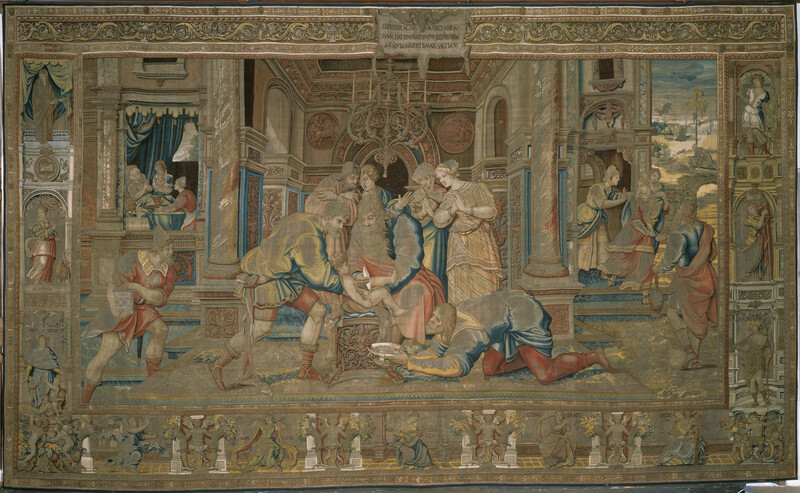 The subsequent use of the tapestries in England is also significant: the set remained at Hampton Court, probably in The Great Hall, but were brought to Westminster Abbey for later Tudor coronations, possibly for Elizabeth I's coronation. They may have been used at early Stuart coronations, as many Tudor rituals were continued under the Stuarts. They were certainly used to splendid effect at the coronation of James II in 1685 when they were hung about the Theatre and Shrine of Edward the Confessor in Westminster Abbey. 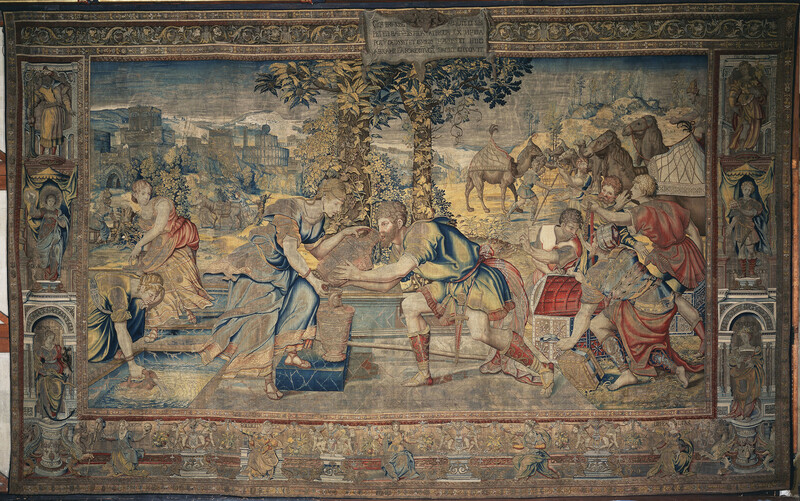 During William III's reign, some of the Abraham tapestries furnished the new King's apartments: that tapestries some one hundred and fifty years old, not a newly commissioned set, were used to furnish the King's Bedchamber, gives a strong sense of the importance and magnificence that these tapestries imparted. 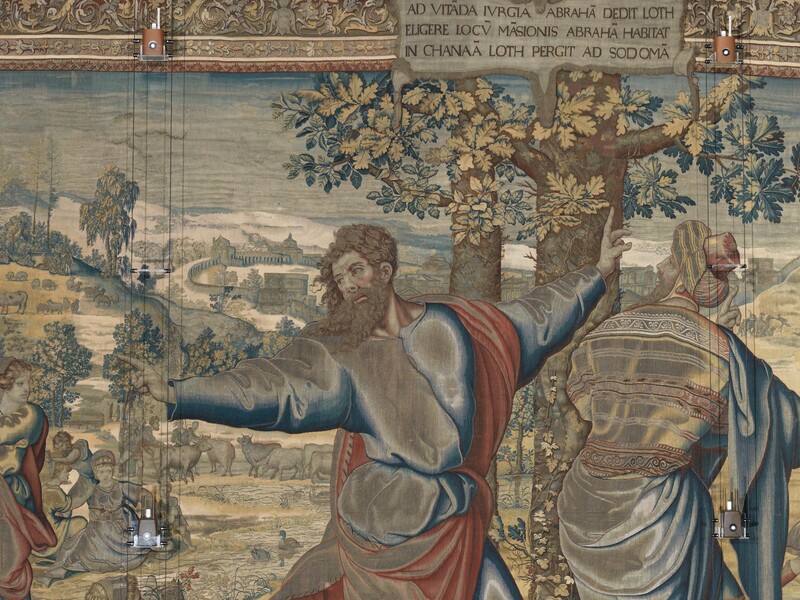 Two other high quality weavings of the same design survive, one in the Spanish royal collection and the other in the former Habsburg collection in Vienna. Neither includes gold thread. 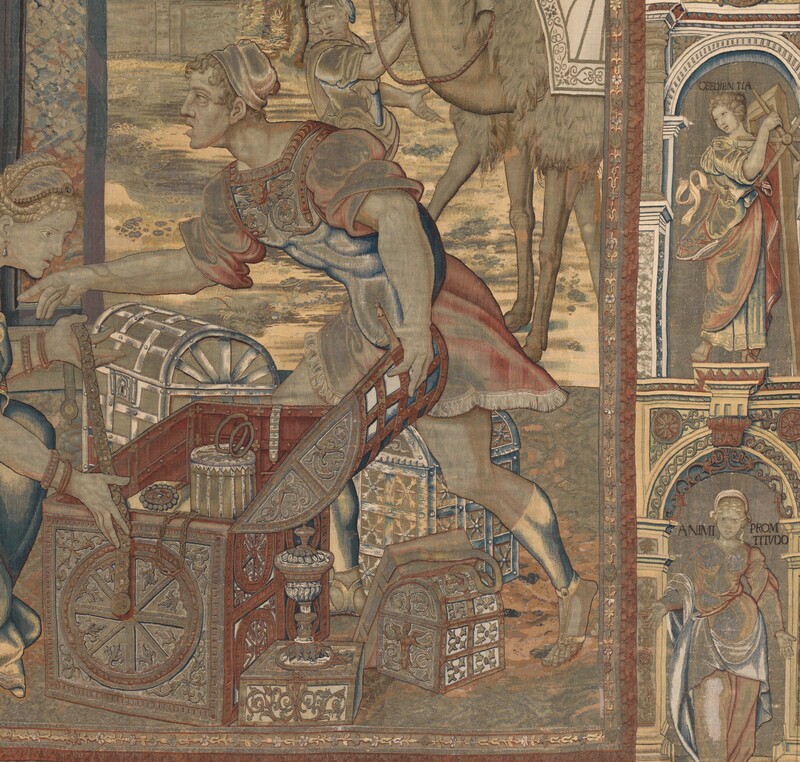 Probably commissioned by Henry VIII circa 1540, and delivered autumn 1543 or early 1544, Hampton Court Palace. 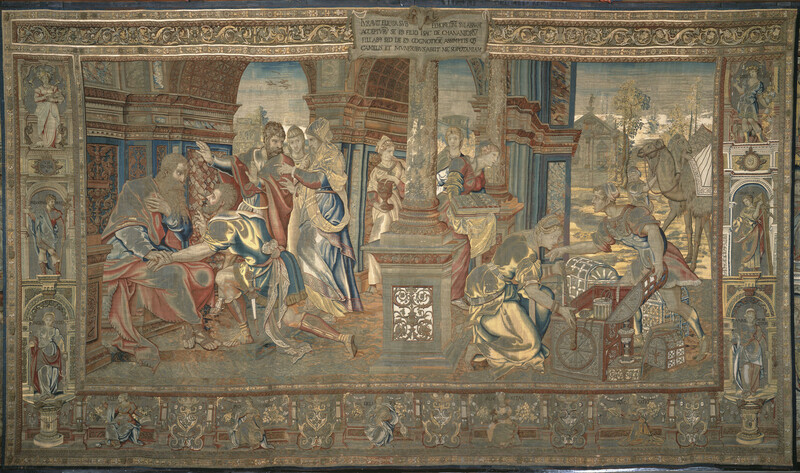 Recorded in 1547 inventory taken after the death of Henry VIII. They were displayed during the solemnisation of the peace with Spain in December 1530, the celebration of St. George's Feast in April 1635, and the receptions of the Moroccan and of the Spanish ambassadors in 1637 and 1649 respectively. Recorded in the 1649 inventory of Charles I's Goods when they were valued at £10 per yard or £8260. Pieces from the set were hung in Westminster Abbey for the coronations of Charles II and James II. Mentioned in the 1695 inventory taken after Queen Mary II's death. 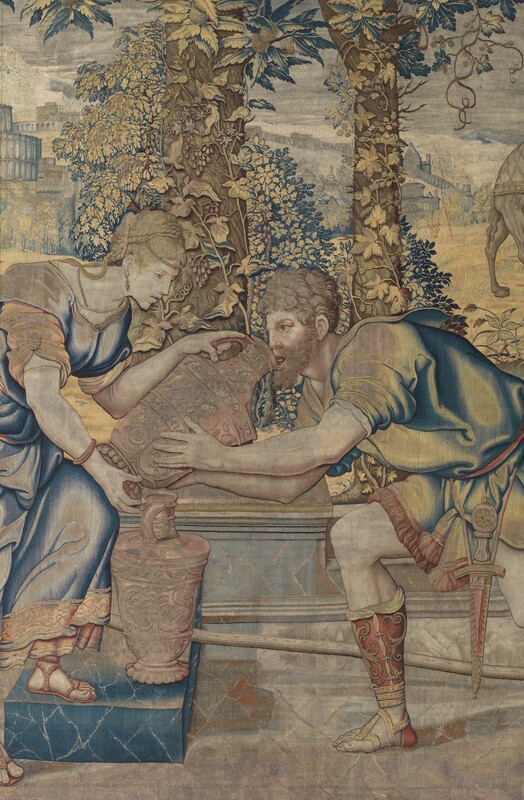 In 1742 tapestries from the set were recorded in the Audience Chamber and Drawing Room.